Little Ngiri is the smallest warthog in Africa. All the warthogs tease him about his size, and the other African animals call him the ugliest creature they’ve ever seen. This teasing makes poor Ngiri feel miserable. But when he meets the old Wildebeest everything changes - the Wildebeest gives him a set of magic jungle drums which promises to make all his dreams come true. Ngiri makes his wish but finds that it has been granted in a very surprising and unexpected way. 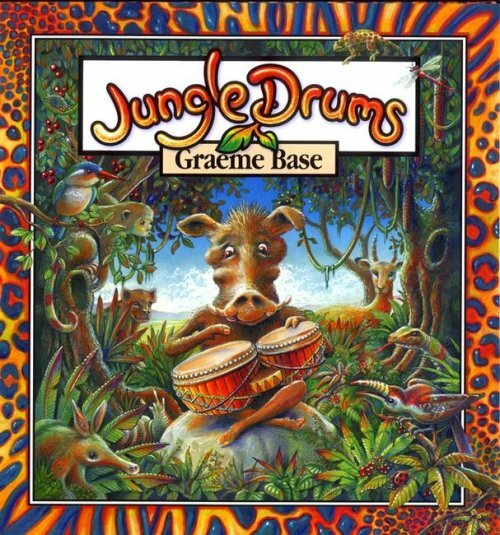 Jungle Drums is a charming book with a gentle message of self-confidence and being comfortable in your own skin. I love this book for working on describing as the animals change into all sorts of unusual colours and patterns. The elephant turns orange with black spots, the ostrich gets a trunk, and the giraffe gets black and white stripes - just to name a few! These changes also allow for plenty of discussion around differences (i.e. what the elephant looked like at different points in the story). The text uses many interesting adjectives that are sure to help children with their descriptions (e.g. impressive horn, curly trunk, graceful neck, etc.). For further speech and language targets in Jungle Drums, see the list below.